A simple yet delicious way to enjoy your artichokes. Trim off and discard the small tough outer leaves of each artichoke and the tips of the leaves. Cut off the top quarter of each artichoke. 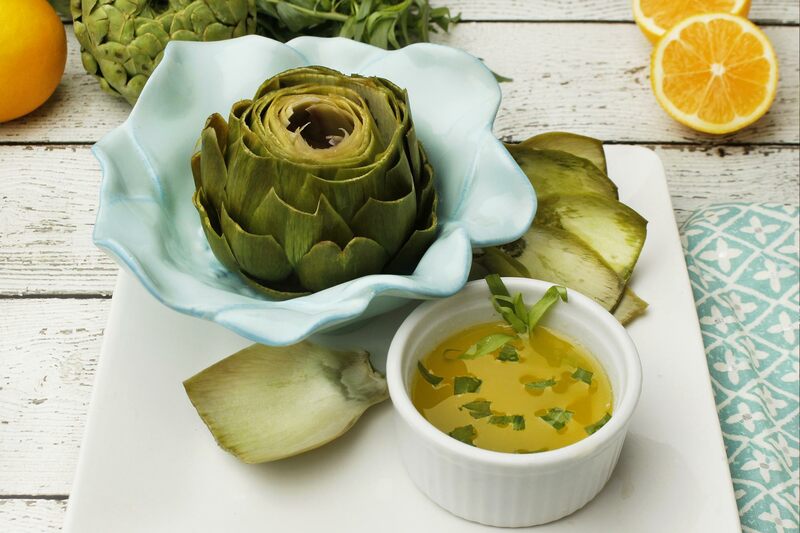 Cut 1 lemon in half and rub it onto each artichoke top, so they don’t brown. Using a vegetable peeler, trim the bottom and sides of the stem. Scoop out the choke (the hairy part) with a melon baller or spoon. Fit a steam basket into a large pot and fill with about 2 inches of water; bring to a simmer. Add the artichokes, open side up and cover the pot with a lid. Steam until tender, about 25 to 35 minutes (add more water if needed). The leaves should pull off easily and the heart should feel tender when pierced. Drain well. Meanwhile, in a sauté pan, melt the butter. Mix in the tarragon, garlic, salt, pepper and a squeeze of lemon. Serve the artichoke with warm tarragon butter and lemon wedges.